The fact that this transmitter allowed me to choose from more than four channels was what caught my attention. Living and working in the NYC metropolitan area, I knew that there are very few, if any, channels that would be clear enough to use a transmitter successfully, so a transmitter that gave me a wide spectrum of channels to choose from was in order. 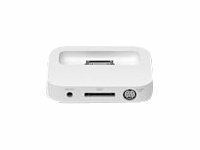 Taking its cue from the iPod itself, the Altec Lansing inMotion iM3 portable audio system packs a powerful collection of features into a compact, portable body. 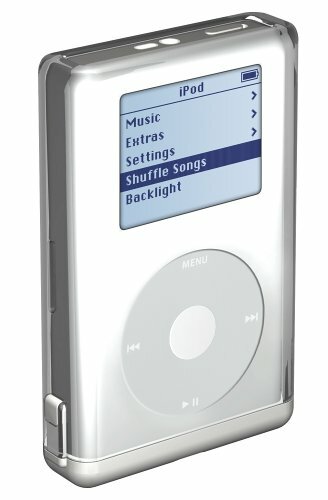 The system, which was designed exclusively for the iPod, is roughly the size of a paperback book, yet each of its sleek speakers delivers crystal-clear, vibrant sound, letting users share their iPod libraries at the park, in a hotel suite, or anyplace else where a set of headphones just won't do. An efficient Class D amplifier powers the four full-range 28 mm neodymium micro drivers, which provide impressively rich and clear high- and mid-range tones. Meanwhile, the system's MaxxBass technology boosts the bass with subwoofer-like results--a rare feature in such a small system. The iM3 also includes a built-in docking station that makes it easy to synchronize, recharge, and transfer data from your iPod while giving users convenient access to the click wheel. And when you're ready to hit the road, the docking station and stand fold up flat against the speakers to fit inside the included carrying bag. At a mere 8 by 5.5 by 1.1 inches (W x H x D), the system is perfect for the light traveler. Listeners can operate the iM3 from a distance thanks to the included remote control, and should users get distracted for any length of time, the system shuts down automatically to conserve power. 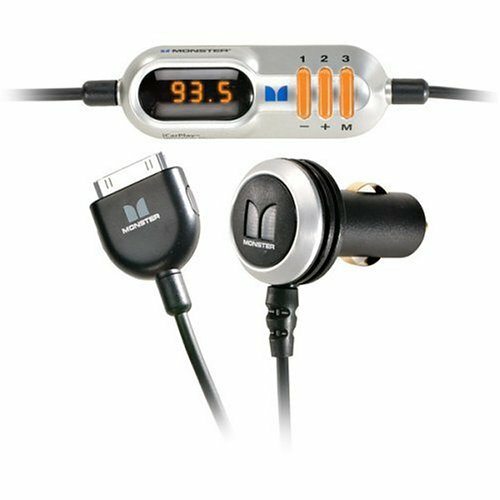 Additional features include a secondary input jack for connecting to other audio devices, such as laptops, older iPods, or other MP3 players (cable included), and an extra-long battery life (24 hours of continuous playback with four AA batteries). If you want to enjoy great sound everywhere you go while still preserving the portable convenience of the iPod, the iM3 is an ideal choice. Just listen. 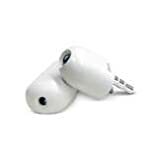 They perform exactly as I had hoped... they help keep the iPod earbuds securely in my ear. Speaking as one who isn't really into the acoustics end of it (I just want to listen to my music without static), these earjams offered a noticeable improvement in sound quality over the included iPod earbuds. I just wish that after the initial purchase, there was an option to purchase additional ear pads only, in specific sizes (as I use the small set and have lost one of those already). I guess I'll just have to spring for a new set. Buy them if you enjoy pain. "Disappointed" isn't a good word to describe my feelings about this purchase.I think a better term would be "tormented".If you look at these closely, you'll notice the serrated edges which attach to the ear buds.This is a grievous design flaw.These things hurt.I'm average-sized, with average-sized ears.After about ten minutes of wear, the serrated edges slowly begin sinking into the tender flesh of my ears.It doesn't matter how good the music is, I'm unable to ignore the pain. Admittedly, there is a modest improvement in the sound quality (compared to the stock iPod headphones) when using these, but it doesn't justify the extreme discomfort they cause.Do yourself a favor and get actual earbud headphones.They'll fit (drastically) better, sound better, and the difference in comfort is the difference between a featherbed and a bed of (sparsely distributed) nails.If you've already purchased an iPod, you've spent a lot of money on a music listening device.Don't blow the listening experience by buying cheap serrated headphone covers that cause you pain. Don't buy them , unless you have extra large sized ears. They're too heavy and too large. The smallestrubberear pads still won't fit comfortably in my ears. I use myipod primarily when walking several times a week. They won't fit snugly and are constantly falling out and have started to irritate myears from the constant reinsertions. 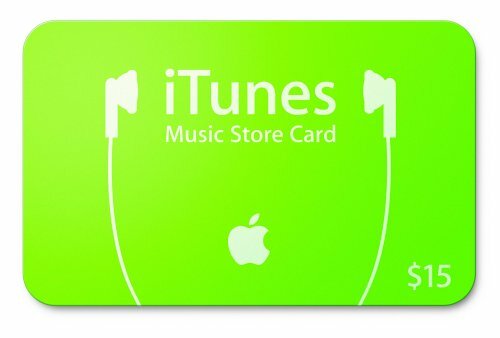 I've stopped using them and will buy something else. Very disappointed. They stay in your ears! I had a terrible time keeping the earbud in my ear until I got these. They also work well to direct the sound into your ear so that you don't need to use as much volume to get excellent sound. Griffin also supplies a nice little case to hold you ear jams and headset. If you don't like things in your ears, you should get a "muff" type headphone. I love these little guys! 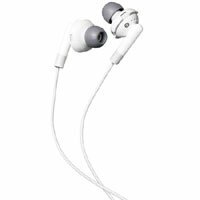 When I got my iPod for my birthday, I was a little put off when I noticed that the earbuds included were the wrong shape for my ears; I walk home from school down a hill through the woods, so they would fall out every few seconds. :-(I needed a solution that wouldn't cost more than my allowance and birthday money could handle, so I decided to try these out.After reading a lot of other reviews, I was worried that they would make my music horrible and mucky, but when I fitted the EarJams into my ears and played some of my music I was very impressed.They don't alter the treble quality enough for me to notice or care, and the bass gets a really enjoyable boost.It also amplifies the earbuds so that 50% volume is about the loudest I would be able to listen to comfortably--VERY good for me, considering how embarrassing it is to be sitting in English class when you realize everyone else can hear your music blasting! If you thought your Apple iPod was just an MP3 player, you're in for a surprise: Griffin Technology's tailor-made iTalk plugs into the top of your iPod and turns your digital music player into a world-class voice recorder with literally thousands of hours of recording time. With iTalk you can record seminars, meetings, classes, notes in your car, songs in the woods, whatever your life or imagination dictates. iTalk's built-in monaural microphone is designed to record crystal-clear audio from sources up to 100 feet away, and onboard Automatic Gain Control ensures optimal recording levels. You can even connect an external microphone directly to iTalk for greater flexibility. iTalk's built-in speaker is great for playback of voice memos. You can also use iTalk as a mini-speaker for your iPod's music files. Play your favorite audio book through iTalk or listen to a downloaded seminar. You'll never realize how much you've missed a built-in speaker--until you have one. I bought the iTalk to take memos when I'm out in the field. Camera in one had, iPod in the other. I read the reviews first so knew it would be risky but it sounded ok for my uses and I got it cheap. * Files are about 1 minute per Mb, stored as wav. * Sound quality is understandable but not as good as AM radio. * For a fully charged iPod, I got about 90 mins recording before the battery showed empty. * Recording works fine, and I can dictate captions for photos as I think of them on site. Typically these are 1-2 minutes at most. I have also made an hour-long recording as a test without problems. I tried recording conversation in a cafe but it picks up too much background to be understandable. * The best feature for photo memos is that files are time stamped, so I copy each memo to the same folder as my photos (which are also time stamped) making them easy to match up. * iTalk can take an external mike which cuts out background white noise. * Software glitches randomly lock up the iPod under almost every condition except for the initial condition (more about this below). * The iTalk covers the iPod lock. This is a serious design flaw given how quickly the battery drains. It means that you can't carry the iTalk connected to the iPod and easily lock the keys. * The line that takes a mic also doubles as a line out. If headphones are connected and you try to record, the recording light shows but nothing is recorded. It creates a file but it's empty. Prevent freezing: If the iTalk is in place when the iPod is turned on, it will often freeze. To prevent freezing, remove the iTalk before turning on the iPod every time. Under these conditions I've never had it freeze. If the iPod does sleep, to prevent freezing, remove the iTalk then insert it again (i'm not sure how often this is necessary, but I haven't had to reset the iPod since the first day). Reset: To reset the iPod, remove the iTalk and hold down the iPod's MENU and PLAY '>||' buttons for 10 sec. I used this 5x the first day with the iTalk but haven't needed it since. Locking: Slide a laminated card (my credit card is too thick) between the iPod and iTalk to lock, or carry the iTalk separately (annoying, but not as annoying as rebooting every time). Saving: It's not enough to pause a recording, you need to remember to stop and save it before removing the iTalk. The MENU button will also save files. Battery: I tried letting the battery run out while recording. It ran for ~50 minutes while the battery was showing empty then shut down with no warning. The file appears to have been saved ok. Despite the glitches, I like having a handy memo system and will keep it til something better turns up. Doesn't sound like Belkin is any better in terms of software glitches or battery life, but it looks like it would be possible to lock the iPod with the Belkin in place which would be a plus. The minus is that Belkin doesn't take an external mic. OK, this is a splitter. You can buy a cheap one anywhere but this one is well-made. The design matches the iPod well but it's functional as well. 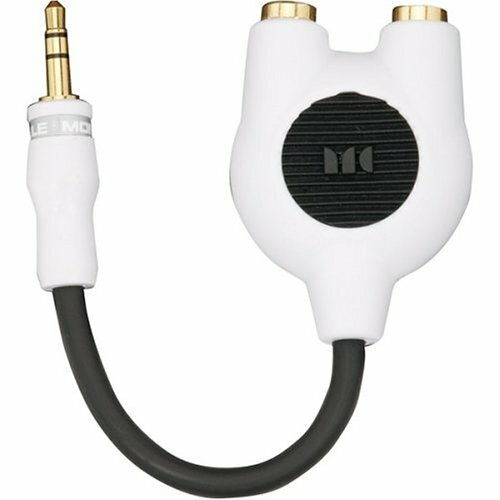 The black circle is a rubberized material with ridges that provide a good place to hold the splitter while you plug or unplug headphones. It works great. I bought the splitter to use with a laptop playing DVD's while on vacation so that my wife and I could both listen with headphones (extremely important not to wake kids, especially while trying to enjoy a quiet moment on vacation). It works well on the plane too where you must use headphones to not disturb other passengers. This thing is sweet, it works great to play your ipod through your stereo!!! IPOD RETURN POLICY is sorta SHORT!! Okay. Here is a write up, that I did, on the comparisons/contrasts on MP3 players. Mainly, the Harddrive versions (I.E. Rio Riot/Apple IPOD -both of which I own) and the flash memory type... (I.E. Memorex 3642 Mp3 Player, of which I own as well). What prompted this little jaunt (of which you may send to as many people as you like) My $499 Apple IPOD died during a sync last month. Just me copying files over to it, and the battery ran out of juice. I would have not attempted to copy music had I known the battery was low, but the battery read FULL STRENGTH. Anyhoo, I called Apple, they said return it for maintenance. I did. Sent it back. They returned it, still broke. To my suprise, there is only a TEN DAY return policy. I did not realize this at all... and it was a costly realization. So, after a month or so of messing around trying to find another MP3 player... I decided to go with a flash memory MP3 player, the ones that use memory sticks. SO, here are the pro and cons of these devices. -Cheaper. WAY CHEAPER than Hard drive types. -If you go into music match and file convert to MP3 Pro and shrink the size of your MP3 to like, say 3o percent... you can really make a good Kompression. Example. My Memorex MP3 player has 32mbs of memory on board. It is expandable to 256mb. 32 mb will basically let you put one cd's worth of music. It is easy to put music on and off of them, due to your computer reading the USB as just another hard drive, so you drag and drop to put on, delete them to take them off. But, after you shrink your files to MP3 Pro 30 percent, you can put twice as many. So, basically a 256mb chip will allow me to put 208 songs on my little less than palm size MP3 player. And it wieghs like 3 ounces. - More on memory. These little chips are the size of the upper part of your thumb, at least my thumb anyway. They come in 128mb, 256mb, 512mb and even though there aren't any MP3 machines out there to handle them YET, you can even buy a 1.5gig thumb size chip thingy. Considering the size of the chips and the shrinking kompression I told you about earlier, I could shrink my whole KOLLEKTION down to 10 of those 1.5gig chips. At the current shrink rate I am at 5 DVD's, which are way bigger and more fragile than these little chips. - Not as fragile as hard drive type. You can drop one of these chips and not scratch it. I wouldn't stomp on one with my foot, nor get one in water, but they are encased in plastic. Ruggedish. - Batteries last for like two days. There isn't much going on here, no moving parts, no laser or hard drive to put power to. Most of these flash Memory types have a single AA battery. I use a rechargeable type, so we are talking very low cost here. In comparison to the hard drive types, where you will get a solid 8 hours of playing, this really whupps up. - Size. Small. Very small. Mine is three inches by three inches. A square. But, you can get smaller ones. And the memory chips that go in them are the same ones you use for your camera. And you can put files on them. If you want to put a word doc on your memory chip, you can. Your Mp3 won't recognize it, but it is nifty storage. - Size does matter. In the case of hard drive Mp3 players... lets face it, you can, if you so chose to, put a library of congress on these monsters. They are the caddilacs of the hand held devices, and guzzle batteries like gasoline. But when it comes down to it, size is the only thing they have going for them. I don't mean to downplay the hard drive types, but don't drop them, don't shake them, and after shelling out $499 to Apple you might consider insurance. Apple doesn't care about you or your apple after 10 days of ownership. Not completely sure why I am getting such a roasting on this review. I am only reporting what happened to me, and how I bought another product and compared the two.... I am not trying to change anyones mind, but letting someone know what happened to me. not just for the ipod! This is a simple minijack splitter that takes one female 3.5mm stereo minijack and turns it into two! Wallah! You can use this anywhere a headphone jack exists. Use it on your laptop computer, your discman, walkman, mp3 player, even the soundcard on your pc - it doesnt matter it's just a splitter. In typical monster style the splitter is made of the highest possible quality and offers excelent performance. 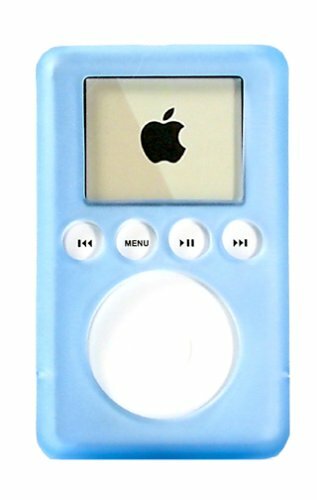 It's also stylish, although it is made to fit with the iPod/iBook design scheme. Bottom line, this type of splitter is ideal for gadget finatics and people who travel a lot and like to bring along thier music (unless you dont ever have the need to share). With this you can allow two pairs of headphones to be plugged into one discman, laptop, mp3 player, etc. If you've ever wished you and your friend could both plug your headphone into your laptop so you could BOTH watch (and hear) a DVD on a bus trip this is the solution. 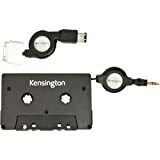 Gain access to your iPod music library whether you're driving across town or across the country with the Kensington cassette adapter, which plugs into your car's cassette deck to play all your favorite tunes. Unlike FM transmitters--which also play iPod music through your car stereo but must be retuned when the signal goes dim--the cassette adapter never suffers from bad reception, ensuring that your music always sounds great. Every bit as convenient, the cassette adapter won't deplete your iPod's power thanks to the included auto charger, which plugs into your cigarette lighter to charge both iPods or iPod minis with dock connectors. The charger is easy to operate, with an LED indicator that notifies the listener when the iPod is plugged in and charging. 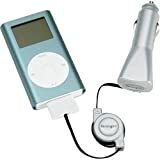 Both the cassette adapter and auto charger come with space-saving retractable cords, with the latter cord doubling as a FireWire/dock connector cable for iPod computer connection. With the Kensington cassette adapter/charger, playing your entire iPod collection in the car is as simple as pulling away from the curb. 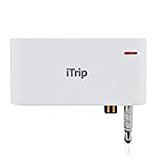 The device is compatible with all iPods and the iPod mini with dock connector and carries a five-year limited warranty. Before I used to think that i would be worth the prive that it was set at, I was wrong. I mean this does serve its purpose and does everything it says, but it is just too overprivced. I could see this at $15, maybe $20, but $40 is just outragous. If you are planning on buying an ipod, buy a 20 or 40 gig, if you really want this. Sepreately, it is just a waste of money. Let's put it this way: I think the dock is great. Aesthetically is much more pleasing to see my iPod propped up securely in this sturdy little accessory. Functionally, the line out jack is great for hooking up to a stereo. And for the sake caution, I prefer having a spot to place this pricey little unit in, rather than just leaving it lying down, just waiting for the first inadvertant soda can to be set on it, or crushed under a stack of books, and so on. ... But not 5. Because having said all of that, it's really sort of chintzy of Apple to make one have to pay extra for a basic component and, when all is said and done, one you don't necessarily actually need. So, in the end, it's nice, if you can get it -- but if not, you're not missing much. For 40 bucks you get the dock, which is nice. For 75 you get the dock, a Monster Cable audio connection cable with RCA connectors; the Apple USB-iPod cable and the Apple power adapter. Apple calls this its stereo connection kit. In May 2004 it's $5 cheaper on Amazon than at apple.com. Seventy-five bucks is too much for this, too, but bought separately, I know these items would cost quite a bit more than $75. You do need the dock to use the line-level output to your stereo. While it's true the variable output headphone connection works fine, the line-level output provides higher fidelity and eliminates the risk of overloading the inputs on your pre-amp or receiver. If you don't have an iPod yet and you love music, especially if you travel on airplanes, you need one. Just know that podding, like most other things, is a bit of a money pit. The iPod dock may not be worth the price - but it *is* handy if you are into convenience. My iPod came with a bundled dock and I keep in on my desk for charging/syncing. The dock is well designed - seems solidly built and is nice and small. It's also nice how it doesn't have any cables hanging out of it like most docks seem to - you just plug in the regular iPod cable to the back and that's it. I've seen people who have two iPods leave one dock in the living room by the stereo equipment. The audio out jack on the back of the dock allows you to hook it up to your stereo and you can use the dock cable to plug in to the AC charger. 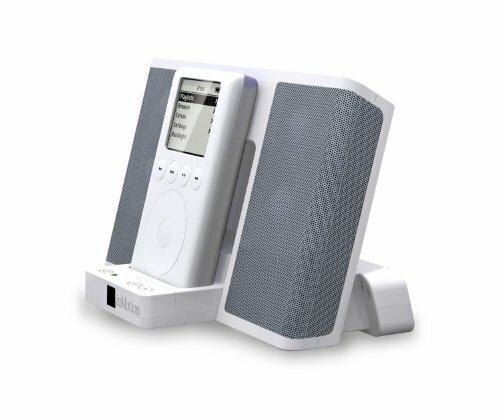 This lets you quickly snap the iPod into its dock to charge and listen to music - however, if you only have one iPod, you'll want to buy an additional cable along with the extra dock so you don't always have to unplug it to sync with your computer. If you're not feeling cheap, I guess it's handy. Next time I can't find my keys in the dark all I need to do is find this thingie and fumble it into my iPod's holes.What a lifesaver! And in the same box is the laser pointer so I don't have to stop listening to 50cent just because I'm doing some silly corporate presentation! 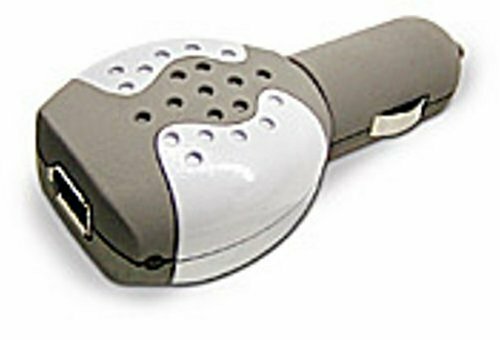 While it is a little tough to dance and fry an airline pilot's eyes at the same time, it is the latest craze so I LOVE THIS PRODUCT! I bought this for my 15GB iPod and it fit like a glove, the clear plastic covers the screen and protects it nicely (no scratches so far). 99.9% of the iPod is protected and the sides are a nice grippy rubber. The arm band that comes with works like a champ and I use it to run with my ipod. The only reason I gave it 4 out of 5 stars is because one of the velcro straps that secure it over the top of the iPod covers the "Hold" switch. Most iPod jackets offer either a hard exterior or a skin-tight fit, which protects a music player from scratches and blemishes but provides minimal protection when dropped on the ground. 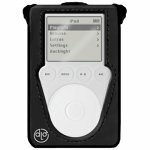 The iPod action jacket, on the other hand, is soft and safe, with a thick 2.5 mm neoprene exterior that cushions your iPod from knocks and blows. Ideal as a workout partner, the action jacket can clip to your pants via the swivel belt clip or wrap around your wrist or arm for hands-free use. It also features a pair of textured rubber grips on the side, so you can hold the jacket securely even when your hands are wet. 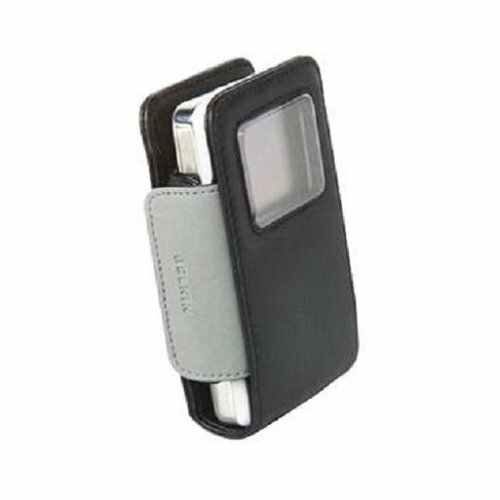 As with the best iPod cases, listeners can still operate the iPod while it's in the jacket thanks to the click wheel opening (with access to the four function buttons) and display window. In addition, the case features a Velcro tab at the top for reaching the Hold button. The action jacket is compatible with both the Apple iPod and iPod by HP. Very protective. I feel better knowing that it's in this case.<br /><br />BUT<br /><br />it's bulky. it was mistaken as a tape player when it was clipped to my belt. Very annoying, having to pull the velcro on each side off to get to the controls.<br /><br />overall, im satisfied with this case, but there has to something better out there. i just put my new ipod in this thing. my once sleek , cool looking mp3 player is now this big fat chunky thing in my pocket. i don't think belkin quite got the idea here. it attaches to the ipod with a plastic suction cup. that's laughable. it got two stars cause instead of one cause it does protect the ipod. i sure wish someone would make one that maintains the "sleek" though.